Linux allows binding of multiple network interfaces into a single NIC using special kernel module called bonding. 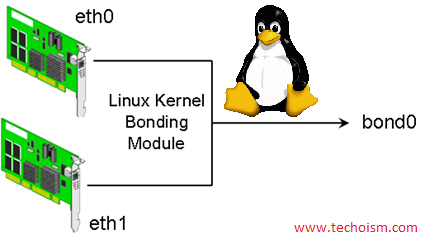 Bonding is Linux kernel feature that allows to aggregate multiple interfaces into a single virtual link. If one physical NIC is down then automatically all the resource move to other NIC card. Channel bonding will work with the help of bonding driver in kernel. In this article we will help you how to create NIC Bonding. Now modify the network configuration file by adding the Master and Slave directives. Create bonding.conf file to add the below line in /etc/modprobe.d/ directory to load the bonding module in to kernel. File name can be anything with “.conf” extension. Run the following command to load the bonding module. Restart the network service now. To check the status of linux kernel bonding driver, you need to execute below command. Run the following command to verify whether “bond0” has come up with IP or not.